Football - Holmfield v Copley. Sam Shaw for Holmfield and Chris Reeder for Copley. Promoted Mixenden are up to second in the Premier Division after a strong final quarter gave them a 6-3 win away to Hebden Royd Red Star. The visitors had a makeshift look at the back with Scott Cartman and Adam Burke filling the centre back roles and Michael Griffin standing in between the posts. Lewis Oldridge gave the visitors the lead, Star levelled and then a Damien Randall penalty put Mixenden 2-1 up at half time. Red Star struck twice to take the lead but Billy Riley got Mixenden on terms midway through the second half. Randall took the visitors clear, completing his hat-trick with a good free-kick and a brilliant solo goal before Kieran Foster completed the scoring. Inactive Calder ‘76 are still four points clear after Shelf United and Midgley United were held at home. Shelf shared eight goals with visitors Warley Rangers, again paying the price for conceding what they felt were sloppy late goals. Dan Kirman gave Warley the lead from the penalty spot after James Goodwin’s foul on Carlton Balmer. Good work on the right from Jimmy Andrews set up Rob Shaw for a tap-in and Shelf took the lead just before the break through Oliver Coates’s left-foot shot after good build-up play. Coates made it 3-2 at the back post and although Tom Hiley muscled his way through and beat ‘keeper Ethan Daley at the second attempt, Andrew beat off a couple of tacklers to put Shelf 4-2 up. Josh Prestage gave Warley hope after a bout of head tennis and Hiley chipped the ‘keeper with a couple of minutes left to tie things up. Midgley drew 2-2 with Northowram, who bagged a late equaliser. Midgley missed plenty of chances but could have lost, the Rams hitting a post with a late free-kick. Matthew Rushworth headed the visitors in front from a corner after 25 minutes but Midgley were playing some decent football and Jason Cartlidge and Ryan Jeffries set up Greg Spink to make it 1-1. James Yates’s good low strike from the edge of the box gave the home side the lead on the hour and Midgley thought a Jeffries effort had crossed the line before being cleared. The Rams had appeals for a penalty turned down before Shaun Popek made it 2-2 with 10 minutes left and then struck the woodwork. 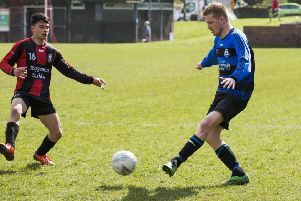 Copley United won 5-2 away to Holmfield in the battle of the bottom two. A hat-trick from Tom Willars helped them pick up their first points of the season in only their third game. Greetland were shunted to the bottom after crashing 6-0 away to Ryburn United, who were responding to a defeat by Warley in their previous league outing. Christian Silkstone struck twice. Promoted pair Brighouse Sports and Illingworth St Mary’s continue to set the pace in Division One. A Chris Allan hat-trick helped Brighouse beat visitors Denholme United 4-1 while John Booth bagged four as Saints continued their free-scoring form in a 7-0 win away to Calder ‘76 Reserves. Sowerby United are third after a comfortable 5-1 win away to Salem. Clever work from Alex Healey set up Oliver Smith to send Sowerby on their way and that was quickly followed with a goal from Lee Barber, who drilled a shot low into the corner of the net. Dan Boyd’s header from a corner made it 3-0 but Sowerby had a penalty brilliantly saved by Salem keeper Lewis Scott with the last kick of the first half. Salem pulled one back through Scott Fieldhouse before Rory Thickett bagged Sowerby’s fourth. Sowerby’s commanding display was capped when player manager Garry Boyd rose above everyone to score with a powerful header. Jordan Goldthorpe and Jake Bradbury were on target as Elland United beat Midgley United Reserves 2-0.
fourth-placed United moved two points clear of town rivals Elland Allstars, who had to settle for a 4-4 draw away to AFC Crossleys, for whom Craig Gladwin scored a brace. Veteran skipper Andy Hurcombe scored four goals as Greetland Reserves continued their good run with an 8-0 home win over Sowerby Bridge Reserves. Hurcombe scored a first half hat-trick, the first being a superb left footed volley from an Ady Ford corner. Gary Taylor and Dave Sloan also scored good goals to put the hosts 5-0 up at the break. Craig Hare came off the bench in the second half to score twice in his first outfield appearance this season, his first goal being a very well struck effort into the bottom corner. Hurcombe added another from the penalty spot after Taylor was brought down. Illingworth St Mary’s Reserves continued their strong run with a fine 5-2 win over Shelf United Reserves. Jack Pullen opened the scoring with a neat header and Harvey Partington doubled the lead when he broke clear and calmly finished. Shelf pressed for long periods in the second half and it was no surprise when they made it 3-2. However, Illingworth made the game safe with two late goals from 16 year old substitute Bradley Madin. St Columba’s had veteran goal keeper Zahid Hassan to thank as they made it six wins from seven in Division Two with a 2-1 home victory over Hebden Royd Red Star Reserves. The only goal of the first half came when a long Josh Godfrey throw was flicked on by Ben Caldwell and George Cook was there to pressure the defender and help to bundle the ball over the line. Red Star equalised midway through the second half with a well struck low free kick that went through the Saints wall, leaving the game in the balance. With 15 minutes left George Cook tried his luck from 25 yards and a slight touch from a defender saw the ball drop under the crossbar to regain the lead for Columba’s. In the end Hassan was the hero, after Ben Caldwell conceded a harsh late penalty. Hassan got down low to his left to parry the spot kick and was quick to get out and knock the follow up effort over the bar with his legs. Royd almost scored from the resulting corner but Hassan palmed an effort bound for the top corner over the bar.